The Mandatory Soft Story Retrofit program requires property owners to seismically strengthen vulnerable buildings that have an increased risk of danger during an earthquake. These buildings are older, wood-framed, multi-family buildings with a soft-story condition. This program has been designed to increase the safety of your building and your tenants, as well protect your investment, during an earthquake. It requires that, if your building has been determined through a screening process involving the Department of Building Inspection and a licensed design professional to be a part of this program, your building undergo a seismic retrofit. This will require work be done to the lower level (only) of your building, and this work will be started and completed according to the tier in which your building has been screened. Tier IV - Any building containing ground floor commercial uses (Building Code Occupancy B or M), or any building in a mapped liquefaction zone. For information about liquefaction please visit the City’s Earthquake Safety Implementation Program (ESIP) website. shown to be properly permitted and completed. Note: Construction is limited to the ground floor where large openings such as garages or commercial storefronts take away the shear walls of the building. STEP ONE: SCREEN YOUR BUILDING – All participating properties screening forms were due on September 15, 2014. All Screening Forms are past due, as of September 15, 2014. 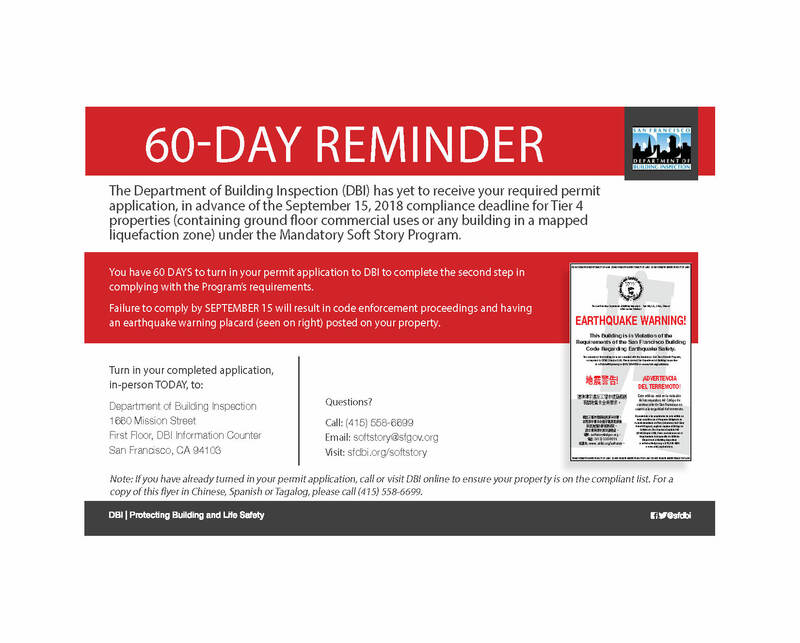 All owners who have not completed this form, do not complete this form, or fail to remedy failing to complete this form are in violation of the San Francisco Building Code (See our Violation section below). 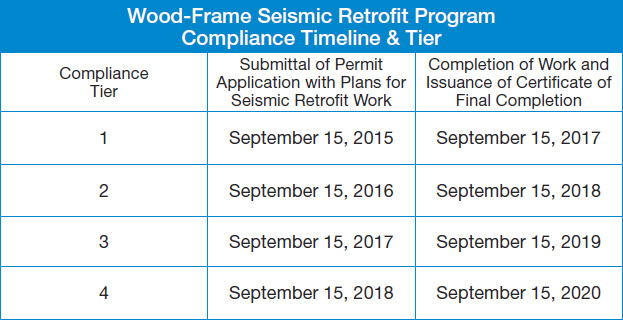 As stipulated by law, you will need to take the next steps to ensure your property is seismically retrofitted by the timeline below. Deadline for Tier 4 properties is September 15, 2018. Failure to submit permits and plans to DBI by the deadline will result in code enforcement action and monetary penalties. Tier 1 and 3 properties are urged to act now and follow the FOUR STEPS below to obtain the permit to complete the required seismic upgrade. STEP 1: Work with licensed design professional to obtain plans & calculations prior to permit application submittal. Before you visit our offices, you’ll need to have two sets of plans prepared by a licensed architect, civil or structural engineer. Drawings shall be a minimum size of 11”x17”and drawn to scale at minimum of 1/8"=1'0". The first page of plans is required to be wet-signed and stamped by the design professional of record. Following pages may have a signature facsimile and professional seal with valid registration number. The submittal documents should also include one set of structural calculations with the cover pages wet-signed and stamped. 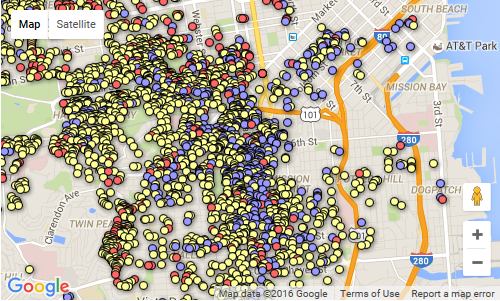 STEP 2: Visit DBI at 1660 Mission Street to file the permit application. Once you have the plans completed, visit DBI’s 1st floor information counter at 1660 Mission Street and complete permit application Form 3/8. Once the form is complete, staff will check application for completeness and direct you to the required routing stations based on the proposed scope of work. STEP 3: Proceed with work accordingly once permit is issued. It is important to know that as construction work begins, you will need to keep track of required inspections. Before the construction work has begun, you will need to contact the district inspector and ensure that any and all special inspections are completed and signed off by the special inspector prior to your Final Inspection. All inspections must be completed and signed off before the compliance tier deadline. STEP 4: Completion in compliance of the Mandatory Seismic Retrofit Program. You will need to request the issuance of the Certificate of Final Completion (CFC) once the job card is signed off after a Final Inspection by the building inspector. A copy of the CFC document will then need to be submitted to the Soft Story Counter Window #8 on the 1st Floor at 1660 Mission Street, or emailed to softstory@sfgov.org in order to complete your participation in the Mandatory Seismic Retrofit Program. The City is currently offering a public financing option, developed in partnership with the City Administrator’s Office, Mayor’s Office, and AllianceNRG-Deutche Bank, for property owners wishing to finance their retrofits. Please visit our finance options page. SEAONC also maintains a page that explains the value of hiring an engineer and how to hire an engineer. The State of California Department of Consumer Affairs provides a license search for structural engineers. Please click this link. The State of California Department of Consumer Affairs provides a license search for contractors. Please click this link. The State of California Department of Consumer Affairs maintains a website explaining the process of hiring a contractor. Please click this link. The American Institute of Architects, San Francisco (AIA) maintains a directory of firms available to public. Please click this link to access. Engineers, Architects, Contractors who have provided their contact information at our October 28 workshop. Engineers, Architects, Contractors who have provided their contact information at our November 21 workshop.